According to the statistics, Department of Immigration and Border Protection (DIBP) has seen a 78% increase in partner visa applications from end of FY2014 to end of FY2015. With those partner visas lodged onshore (i.e. lodged while the applicant is in Australia), there were 1,031 cases where the applicants were in unlawful Australian residency status. Some might just have forgotten to renew their visas, while some might have been unlawful for a period of time. This group of onshore partner visa applications will then subject to a specific assessment of “Schedule 3 Criteria”. Schedule 3 Criteria permits unlawful non-citizens to apply for a visa in Australia on compassionate or compelling grounds, instead of being required to depart Australia and apply offshore. There is not a set of “examples” for compassionate and compelling grounds, however the ground must be in relation to an Australian citizen or permanent resident, as an individual or a business. Partner visa, due to Migration Act s.48 and its assessment criteria, has been the best option to those who had been unlawful in Australia and would not (or unable to) return to their home country to apply for an Australian visa. Yet, applications refused based on the applicant unable to satisfy Schedule 3 Criteria has been high, hinting unless you have a strong and touching reason to lodge the visa application onshore, you are likely to get your application refused. There has been a long-lasting issue regarding the partner visa program being abused by those unlawful applicants (i.e. overly-claimed of Schedule 3 Criteria), leading to prolonged processing times. The current processing time for onshore partner visa (subclass 820) is 12 to 15 months. DIBP has heightened its focus on community protection risks & checks on certain applications. Make sure you lodge the right visa application at the right time on the right place. It not only assists in your application assessment but also lowers the risks of refusals. Partner visa can be very complicated and, if not in good hands, it could become a disaster. Please be advised that on 01 July 2014, DIBP has changed its policy in relation to Schedule 3 – Criteria 3004, which may affect your application for a Subclass 820/801 visa if you made/make your application when your substantive has ceased or you were/are the holder of a bridging visa or you were/are an unlawful citizen or the last substantive visa you held contained the Condition 8503 ‘No Further Stay’, at the time of the application. (f) The last substantive visa you held (if any) was not subject to a condition ‘8503 – No Further Stay’. If you have not lodged your application or your applications are currently pending with DIBP, you will be likely invited to provide information addressing whether you meet the above criteria. If you are unable to demonstrate that you meet Criteria 3004, the Migration Regulations state that the Schedule 3 criteria may be waived where there are compelling reasons for not applying those criteria. The Migration Regulations do not prescribe the circumstances that need to be considered when assessing whether or not ‘compelling reasons’ exist to not to apply Schedule 3 criteria. Circumstances are therefore considered on a case by case basis pursuant to policy. The law provides firstly that policy must be applied flexibly, and secondly that the Regulations can not be limited by a too narrow policy. 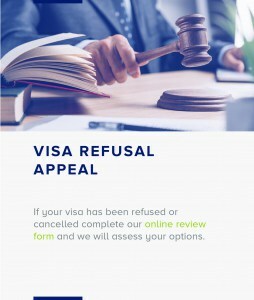 Both the visa applicant and the sponsor should be invited to put forward any claims for DIBP to consider when assessing if compelling grounds exist. The visa applicant should explain in detail the circumstances that led you to become the person who is not the holder of substantive visa and provide information relating to any compelling reasons you may feel apply to your case. You will need to provide relevant documents to support your claims. You will also need to provide documents and information in relation to Regulation 1.09A and 1.15A, which address all matters regarding the relationship between you and your sponsor such as Financial Aspect, Nature of the Household, Social Aspect and the Nature of Commitment to Each Other. 3001 (1) The application is validly made within 28 days after the relevant day (within the meaning of subclause (2)). (ii) the day when the applicant is taken, under sections 368C, 368D and 379C of the Act, to have been notified of the Tribunal’s decision. 3002 The application is validly made within 12 months after the relevant day (within the meaning of subclause 3001(2)). (h) the last entry permit (if any) held by the applicant was not granted subject to a condition that the holder would not, after entering Australia, be entitled to be granted an entry permit, or a further entry permit, while the holder remained in Australia. (h) if the last visa (if any) held by the applicant was a transitional (temporary) visa, that visa was not subject to a condition that the holder would not, after entering Australia, be entitled to be granted an entry permit, or a further entry permit, while the holder remained in Australia. (c) regulation 35AA or subregulation 42(1A) or (1C) of the Migration (1989) Regulations. Note: Section 10 of the Act provides that a child who was born in the migration zone and was a non-citizen when he or she was born shall be taken to have entered Australia when he or she was born. 3001 – This regulation requires that applicants not be unlawful or on a Bridging Visa for more than 28 days since last holding a substantive visa. Accordingly, if an applicant has been unlawful or on a Bridging Visa for more than 28 days, they cannot satisfy 3001. 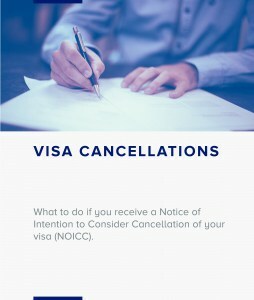 3004 – This regulation requires that applicants be able to demonstrate that (1) they are not the holders of a substantive visa because of factors beyond their control, (2) there are compelling reasons for granting the visa, (3) they have complied substantially with all previous visa conditions, (4) the applicant would otherwise be eligible to have granted the Partner visa, and (5) the applicant intends to comply with any conditions imposed on the Partner visa. As mentioned at the beginning of this blog, if applicants cannot satisfy Schedule 3 (3001, 3003 and 3004), then they must be able to demonstrate there are compelling reasons to ‘waive’ the application of Schedule 3 against them. Unfortunately, there is no way to apply for this ‘waiver’ before the Partner visa is applied for and it is simply assessed in conjunction with all other visa criteria. So the case could be that the Partner visa could otherwise be granted, except that Schedule 3 is not satisfied and an applicant is unable to demonstrate compelling circumstances to have it waived. Government policy shows us that the DIBP will not make it easy for applicants who have purposely remained unlawful in an attempt to circumvent visa requirements to regularize their status through an Australian Partner visa. However, what readers should understand is that the waiver provisions are discretionary meaning that applicants are welcome to put forward all the facts of their relationship to help demonstrate compelling circumstances exist. Importantly, applicants must be able to show that compelling circumstances existed at the time of visa application and not necessarily what has developed after the visa has been applied for.